Black/thrash metal? Oh, it is a foregone conclusion that the band would be another mimic of Venom, Bathory, Sodom or any of the early gods of first wave black metal. Probably many listeners are getting tired after listening to a lot of black/thrash metal bands of this era that are almost repeating the same music in the vein of their predecessors. Well, there are obviously exceptions and Triumphant from Austria has thrilled me with their debut, “Herald the Unsung”. The sonic journey of 40:46 minutes begins with an intro named “Triumfaor”. Apart from Triumfator, another intro “Nightfall” has emerged in the voyage. It would be utterly onerous task to choose the favorite track from the album. All of the seven tracks that appear in the album (excluding the intros) are breathtaking enough to engulf me with sheer delectation. Each of them has its own distinctive hallmark consists of deep and phenomenal components -twisted riffs, harmonious solos, appeasing rhythms, psychotic thrashy vocal deliveries, high pitch screams, solid drumming actions and whatnots. Desaster, Nifelheim, Venom, Slayer, Dissection, Traditional Heavy Metal and even Punk influences are apparent here. Tracks like Nachzehrer, Necromantic Force are a bit faster and rawer approach. Necromantic Force is a track from their “Manic Disease” era and it was also featured in the “Live Necromacy” demo tape, but the album version surpasses the live demo number. Supreme black metal riffs and enchanting solo oriented track “Fullmoon Over Transylvania” will allure the black metal devotees. Zivot Ispod Obrnutog Krsta (aka Life Under the Inverted Cross) that has been sung in Bosnian language is occupied with some finest rhythmic bridges. Title track just reminds me of those vintage guitar moments of Dissection that are melancholic and at the same time are nefarious. Both Devotion and the title track are crafted with supreme atmospheric essences. Vocal’s supreme voices can range from black/thrash to clean voice heavy metal and without any doubt he is able to deliver the perfect voice in terms of the environment of the music. Final track, “Triumphant” is just a proper illustration of the magnificent skill of the vocal. The track has pure traditional heavy metal environs and vocal perfectly match his voice with it. High pitch screaming in the middle of this track is a notable feature. Considering the production of the album, I am obviously giving it a thumb up. Effective production is actually working as a catalyst to make the whole album as a miraculous and because of it astonishing moments of the album are correctly audible. Lyrics deal with evil, occult and horror oriented themes that are probably not as breathtaking as the sound of the album, but deserve appraisal. Especially, the title track and Devotion’s lines are killer. 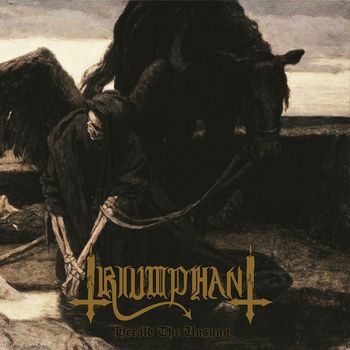 Triumphant successfully re-invents the sound and incorporates the elements of different music in their debut full length. I do not have a single grief about the release and do consider it as one of the best releases of the year. Will the album ever be considered as an outdated one? I will answer it with two words, “Hell No”.